WHY REPLACE THE EAVESTROUGHS / GUTTERS IF THEY ONLY NEED REPAIR? 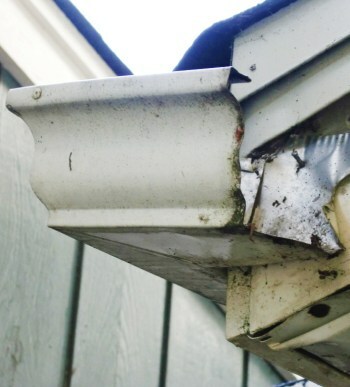 From the perspective of someone with little knowledge, they would likely conclude that the eavestrough / gutter system needs replacing because they see what looks like an obvious problem. While there may indeed be a problem that urgently requires attention, the real question is, “can they be repaired?”. Some companies will prey on the innocent and attempt to suggest that there is no choice but to replace the entire eavestrough /gutter system. Their sole objective and agenda is to make a sale. At Toronto Clear View Window Cleaning, we have been repairing eavestroughs / gutters for decades. Because eavestrough / gutter repair is not our sole business, we don’t have to convince you to replace the eavestroughs / gutters if they only need repair. The savings is HUGE when comparing a repair versus replacement. Customer calls because they realize there is a problem with their eavestroughs / gutters. Company makes an onsite visit and determines the eavestroughs / gutters need to be replaced. It is incredible how many times we hear of stories like this when the reality is that a much less costly repair is all that is needed. 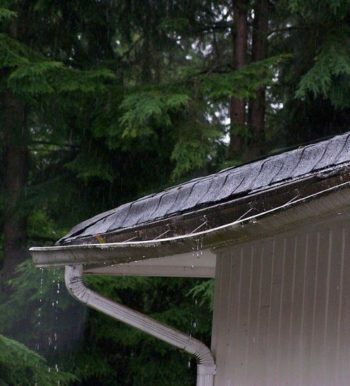 What causes common problems with an eavestrough / gutter system? 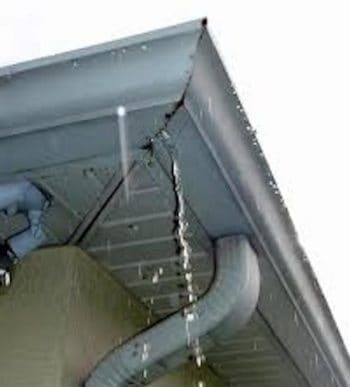 Our climate creates a lot of stress on the eavestrough / gutter system. 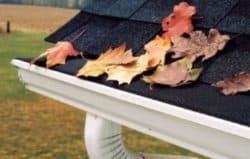 When debris is not removed in the Fall, leaves, heavy snow and ice cause the eavestrough / gutter system to pull away from the house when drains are clogged. Water expands when frozen and causes the nails / spikes or even end caps to pop out or fall off. The result is “water leaks at corners” (PICTURE #1), “water overflow” (PICTURE #2), and popped off end caps (PICTURE #3). 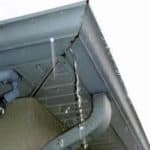 All of these situations require only a repair at a fraction of the cost compared to replacing the entire eavestrough / gutter system. A surface “Whitening” will also bring back that new look. Allow Toronto Clear View Window Cleaning to assess what exactly is really required. If you only need repairs, we will tell you. If you only need a small section replaced, we will tell you. If you do need the entire eavestrough / gutter system replaced, we will tell you and refer you to a company we refer people to that specializes in full replacement type work. 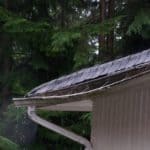 Experiencing anything like these pictures is an eyeopener for many of how important it is to properly maintain the functioning of the eavestrough / gutter system. 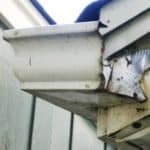 Being on a regular maintenance program that includes cleaning the eavestroughs / gutters at least two times per year, namely, late Spring / early Summer and then again in the Fall, can help avoid the overflow and leaking problems displayed in the pictures. You may want to consider the advantages of installing the patented eavestrough / gutter protection system called Diamond Back, designed to keep the eavestroughs clean year round. Toronto Clear View Window Cleaning has been serving the GTA and surrounding areas since 1989. This tool enables you to instantly find out the cost of minor repair.